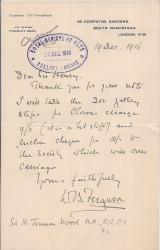 Two Autograph Letters Signed (both 'F. Eber') from Ferdinand Eber ('General Eber'), Hungarian-born 'condottiere-journalist', to fellow Times correspondent Henry Wreford, the second letter discussing Garibaldi, Victor Emmanuel and the Risorgimento. 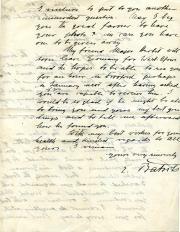 Letter One: 33 St James's Square, London; 16 January [no year]. Letter Two: Palermo, Italy, 20 June [no year]. On 28 February 1885 The Times announced the death of Eber, 'for many years our valued correspondent at Vienna'; and a hundred years later (24 September 1985) the same paper described Eber as 'the condottiere-journalist, General Ferdinand Eber, whose habit of engaging in wars as well as reporting them earned him the displeasure of his masters in Printing House Square'. Both items in good condition, on lightly-aged paper, with slight damage from previous mounting. Both addressed to 'My dear Wreford', and both written in a difficult hand. Letter One: 3pp., 12mo. Printed lithographic certificate for a gymnastic pyramid designed by Adolf Schlieder of Gohlis, with autograph signature of Adolf A. Stempel, director of Stempel's Physical Training Institute and Gymnasium, Regent's Park, London. Certificate: Gohlis [Saxony]. 1888. 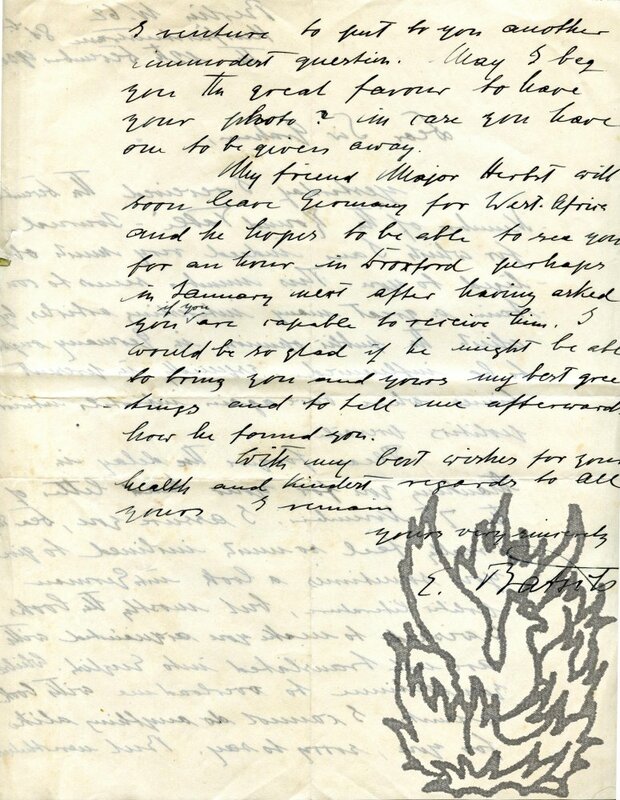 Stempel's signature dated from London, 12 April 1888. On one side of a piece of 11 x 22.5 cm card. In fair condition, aged and a little worn, with one crease. Crude but attractive design, within a thick-thin border, depicting a gymnast within a sylvan setting, holding a laurel wreath over the head of a bald and bearded figure (presumably Schlieder). To the gymnast's left is a large banner bearing the motto: 'FRISCH FROMM FRÖHLICH FREI'. Six Autograph Letter Signed from 'W. 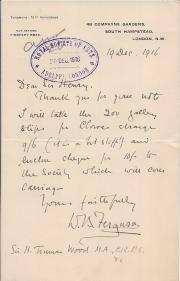 B. Ferguson' (William Bates Ferguson) to Sir Henry Truman Wood, Secretary, Royal Society of Arts. 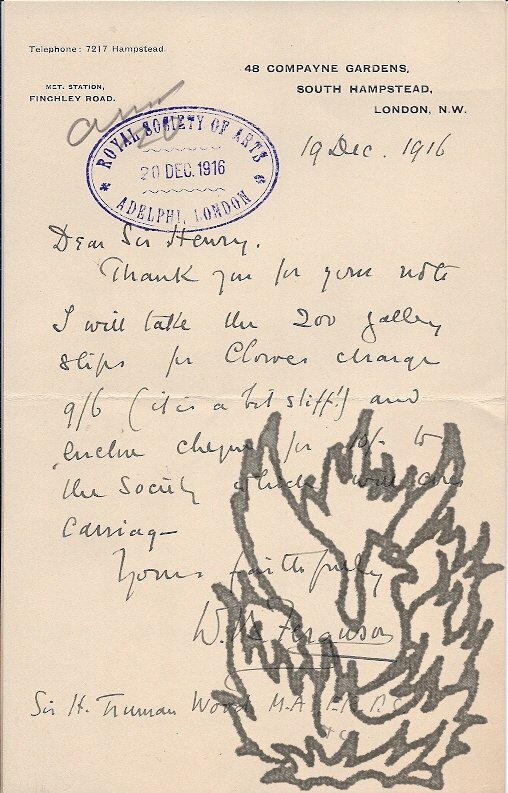 18 November to 19 December 1916; all on letterhead of 48 Compayne Gardens, South Hampstead, London N.W. All in good condition on lightly-aged paper, and all but one (Letter Five) bearing the Society's stamp. Letters One, Two and Six docketed. Letter One (18 November): 12mo, 2 pp. Hoping that Wood, 'as an Ex President of the Royal Photographic Society of Great Britain', will 'help the Hurter and Driffield Memorial Fund [of which he is Honorary Treasurer] which is being got up [by the Royal Photographic Society] [...] to do honour to the memory of those famous workers in the Chemistry & Physics of Photography'. Letter Two (26 November): 4to, 2 pp.